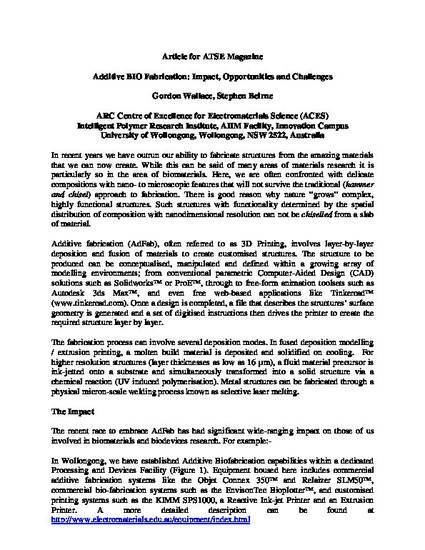 Gordon Wallace and Stephen Beirne, Additive BIO Fabrication: Impact, Opportunities and Challenges, ATSE Magazine, Academy of Science, Technology and Engineering, 2013. Online copy also available here. In recent years we have outrun our ability to fabricate structures from the amazing materials that we can now create. While this can be said of many areas of materials research it is particularly so in the area of biomaterials. Here, we are often confronted with delicate compositions with nano- to microscopic features that will not survive the traditional (hammer and chisel) approach to fabrication. There is good reason why nature “grows” complex, highly functional structures. Such structures with functionality determined by the spatial distribution of composition with nanodimensional resolution can not be chiselled from a slab of material. Additive fabrication (AdFab), often referred to as 3D Printing, involves layer-by-layer deposition and fusion of materials to create customised structures. The structure to be produced can be conceptualised, manipulated and defined within a growing array of modelling environments; from conventional parametric Computer-Aided Design (CAD) solutions such as Solidworks™ or ProE™, through to free-form animation toolsets such as Autodesk 3ds Max™, and even free web-based applications like Tinkercad™ (www.tinkercad.com). Once a design is completed, a file that describes the structures’ surface geometry is generated and a set of digitised instructions then drives the printer to create the required structure layer by layer. The fabrication process can involve several deposition modes. In fused deposition modelling / extrusion printing, a molten build material is deposited and solidified on cooling. For higher resolution structures (layer thicknesses as low as 16 µm), a fluid material precursor is ink-jetted onto a substrate and simultaneously transformed into a solid structure via a chemical reaction (UV induced polymerisation). Metal structures can be fabricated through a physical micron-scale welding process known as selective laser melting.